Armed with a screamingly fast hex-core CPU and a fairly potent graphics card, the $1,200 Dell G7 15 packs an impressive amount of processing and gaming power into a shell that’s less than an inch thick. Gamers looking for the highest frame rates possible will find better value in a quad-core laptop with a beefier GPU, while those in search of a thinner and lighter hex-core gaming laptop should check out the pricey MSI GS65 Stealth Thin 8RE. But if you’re on a budget and want enough CPU power to stream or create videos while gaming, the G7 15 is (for now, at least) an enticing, reasonably priced choice. Beyond the limited customization options, there are few other concessions the Dell G7 15 imposes. Dell's G7 15 Gaming is a compelling value for cost-conscious gamers or performance enthusiasts looking to maximize their return on investment. Positive: Good price; nice performance; decent hardware; long battery life; elegant design. Negative: Uncomfortable keyboard; mediocre speakers; poor display. Positive: Beautiful design; powerful GPU; support Thunderbolt 3; high gaming performance; solid workmanship. Negative: Relatively high price. Positive: Powerful processor; good cooling system; nice gaming performance; excellent display; good connectivity. Negative: Thick frames. Positive: Powerful hardware; high gaming performance; solid workmanship; stylish design; fast fingerprint sensor. Model: The Dell G7 15-7588 is a 15-inch gaming laptop designed for a powerful, immersive in-game experience featuring an Nvidia GeForce GTX 1060 graphics and the latest 8th Gen Intel Quad-and-Hex Core CPUs. Dell gaming machines are engineered with the specific, demanding needs of the gaming audience in mind. From the latest processors to powerful discrete graphics cards, they make every experience more intense and real. At 25mm, this system is both powerful and portable, with style to spare. It has durable magnesium alloy braces for exceptional rigidity. A luxe palm rest with brushed metal finish completes the ultra-sleek look. 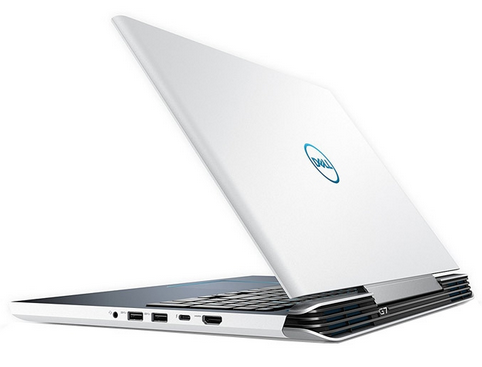 The Dell G7 15 laptop is available in alpine white or licorice black. For cooling, the aggressive sub-1" design is equipped with huge cooling vents and dual-fan cooling technology to ensure the system never buckles under the load of demanding games while still staying cool and quiet. As for hardware specifications, the Intel Core i7-8750H CPU rips through processing functions. With an Nvidia GeForce GTX 1060 graphics with Max-Q Design technology and up to 6 GB GDDR5 video memory, gameplay is clear and detailed. Besides that, the system features a 128 GB NVMe PCIe SSD, which run up to 4x quicker than a conventional SATA drive. Users can load apps or data faster, run machine faster, stretch battery life and improve shock resistance. For display, users can witness everything on screen with stunning clarity and superior color richness thanks to the non-touch IPS FHD panel with a resolution of 1,920 x 1,080 pixels. The display is equipped with anti-glare panels to create a wider range of environments. Furthermore, the full-size HDMI 2.0 port plugs into external monitors and supports up to 4K for a fully immersive top-tier gaming experience. The keyboard of the laptop is a Chiclet-style keyboard. Users can make every click count on a keyboard built with multiple layers of reinforcement, 1.4 mm keystroke travel and optional blue backlighting with WASD keys. Thanks to two tuned, front-firing speakers powered by Waves MaxxAudio Pro To experience every beat of the action can be experienced with improved clarity and imaging. Users can elevate gaming, viewing and mega-tasking with the one-two combo of SmartByte and Waves MaxxAudio Pro. The laptop is powered by an integrated 4-Cell 56 WH quick-charge battery, which increases by 25 % in 15 minutes, so users never miss a minute of high-powered action. Users can enjoy the convenience of single-cable docking video, data and power need with a SuperSpeed USB 3.1 Gen 1 Type-C port that supports DisplayPort, Power Delivery and Thunderbolt 3. As a conclusion, the Dell G7 15-7588 is a gaming laptop that packs an impressive amount of processing and gaming power into a shell that is less than an inch thick. It is suitable for gamers who want an affordable gaming laptop that features mid-range performance.